Thomas Jefferson drafted the Declaration of Independence in Philadelphia behind a veil of Congressionally imposed secrecy in June 1776 for a country wracked by military and political uncertainties. In anticipation of a vote for independence, the Continental Congress on June 11 appointed Thomas Jefferson, John Adams, Benjamin Franklin, Roger Sherman, and Robert R. Livingston as a committee to draft a declaration of independence. The committee then delegated Thomas Jefferson to undertake the task. Jefferson worked diligently in private for days to compose a document. Proof of the arduous nature of the work can be seen in the fragment of the first known composition draft of the declaration, which is on public display here for the first time. Jefferson then made a clean or "fair" copy of the composition declaration, which became the foundation of the document, labeled by Jefferson as the "original Rough draught." Revised first by Adams, then by Franklin, and then by the full committee, a total of forty-seven alterations including the insertion of three complete paragraphs was made on the text before it was presented to Congress on June 28. After v oting for independence on July 2, the Congress then continued to refine the document, making thirty-nine additional revisions to the committee draft before its final adoption on the morning of July 4. The "original Rough draught" embodies the multiplicity of corrections, additions and deletions that were made at each step. Although most of the alterations are in Jefferson's handwriting (Jefferson later indicated the changes he believed to have been made by Adams and Franklin), quite naturally he opposed m any of the changes made to his document. Congress then ordered the Declaration of Independence printed and late on July 4, John Dunlap, a Philadelphia printer, produced the first printed text of the Declaration of Independence, now known as the "Dunlap Broadside." The next day John Hancock, the president of the Continental Congress, began dispatching copies of the Declaration to America's political and military leaders. On July 9, George Washington ordered that his personal copy of the "Dunlap Broadside," sent to him by John Hancock on July 6, be read to the assembled American army at New York. In 1783 at the war's end, General Washington brought his copy of the broadside home to Mount Vernon. This remarkable document, which has come down to us only partially intact, is accompanied in this exhibit by a complete "Dunlap Broadside" -- one of only twenty-four known to exist. On July 19, Congress ordered the production of an engrossed (officially inscribed) copy of the Declaration of Independence, which attending members of the Continental Congress, including some who had not voted for its adoption, began to sign on August 2, 1776. This document is on permanent display at the National Archives. On July 4, 1995, more than two centuries after its composition, the Declaration of Independence, just as Jefferson predicted on its fiftieth anniversary in his letter to Roger C. Weightman, towers aloft as "the signal of arousing men to burst the chains...to assume the blessings and security of self-government" and to restore "the free right to the unbounded exercise of reason and freedom of opinion." 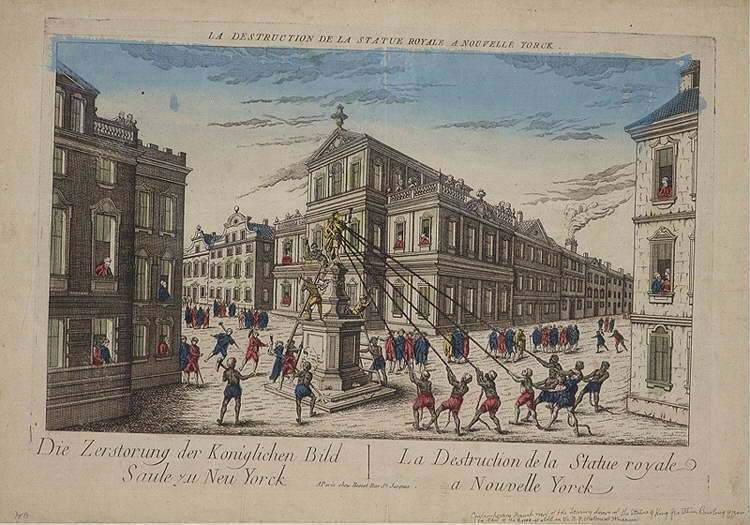 These images are from a special exhibition in a series of public previews of unique documents from the collections of the Library of Congress. These previews will culminate in the permanent exhibition, "Treasures of the Library of Congress," funded by the Xerox Foundation, which will open in 1997, the 100th anniversary of the Thomas Jefferson Building. 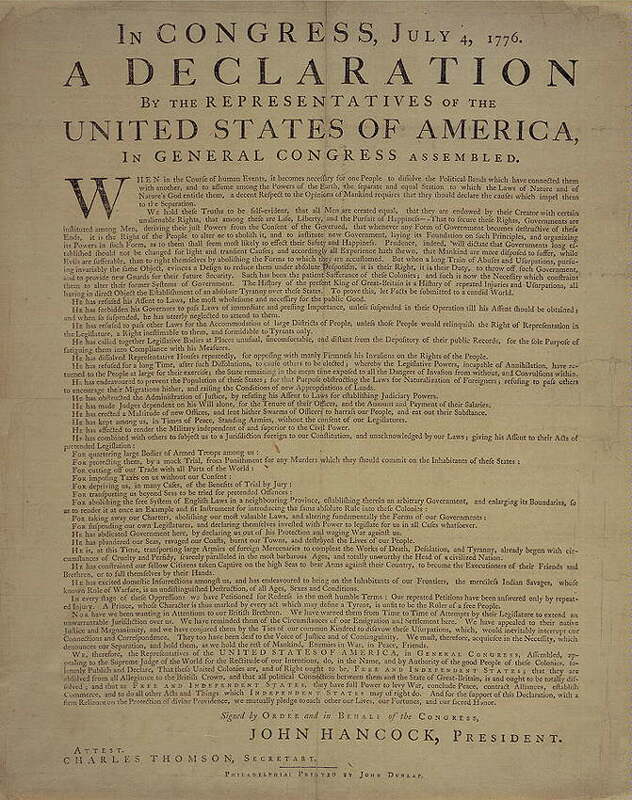 One of twenty-four surviving copies of the first printing of the Declaration of Independence done by Philadelphia printer John Dunlap in the evening of July 4,1776. Fragment of George Washington's personal copy of the "Dunlap Broadside" (131k) of the Declaration of Independence, sent on July 6 to George Washington by John Hancock, president of the Continental Congress.The text is broken at lines thirty-four and fifty-four, with the text below line fifty-four missing. General Washington had the Declaration read to his assembled troops in New York on July 9. Later that night, the Americans destroyed a bronze statue of Great Britain's King George III (77k) which stood at the foot of Broadway on the Bowling Green (The tail of the horse is in the New York Historical Museum). A contemporaneous print representing the committee of five delegates, chaired by Thomas Jefferson, that was appointed to prepare a declaration of independence. 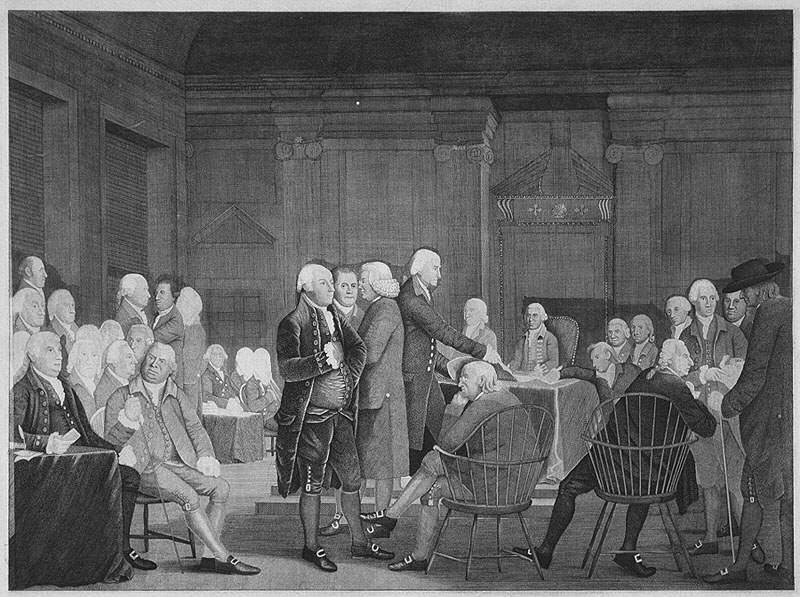 They are shown submitting their draft of the Declaration of Independence to the Continental Congress, June 28, 1776 Edward Savage's engraving (86k) , based on Robert Edge Pine's painting of the presentation of the Declaration of Independence to the Continental Congress, is considered one of the most realistic renditions of this historic event. Jefferson is the tall person depositing the Declaration of Independence on the table. Benjamin Franklin sits to his right. John Hancock sits behind the table. Fellow committee members, John Adams, Roger Sherman, and Robert R. Livingston stand (left to right) behind Jefferson. 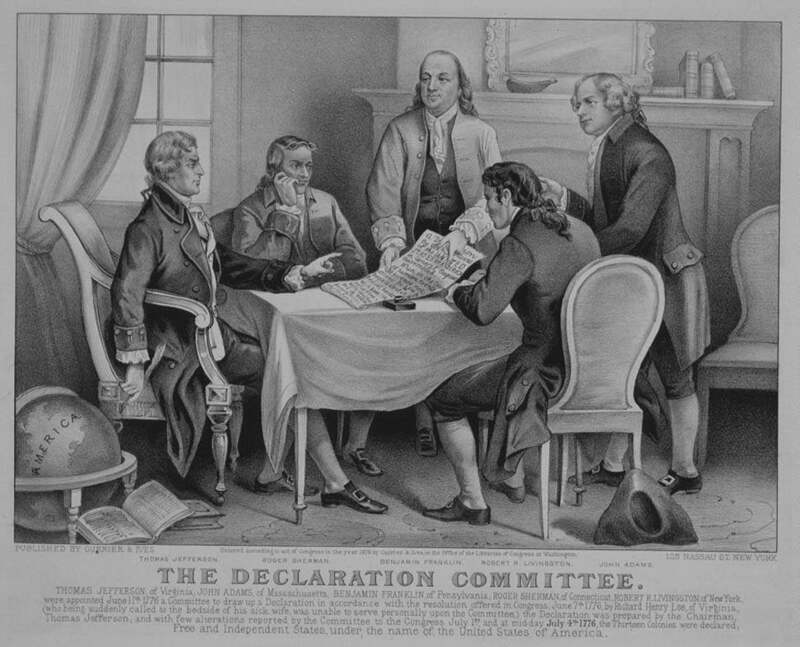 An 1876 print representing the "Declaration Committee," (107k) chaired by Thomas Jefferson, which was charged in June 1776 with drafting a declaration of independence for action by the Continental Congress. The "Declaration Committee," which included Thomas Jefferson of Virginia, Roger Sherman of Connecticut, Benjamin Franklin of Pennsylvania, Robert R. Livingston of New York, and John Adams of Massachusetts, was appointed by Congress on June 11, 1776, to draft a declaration in anticipation of an expected vote in favor of American independence, which occurred on July 2. Currier and Ives prepared this imagined scene of the writing of the Declaration for the 100th anniversary of the Declaration of Independence.